"Overall I would call it a magical experience... I commend you for your mastery of the instrument, your skill in articulating all in clear concise terms, and your commitment to give every individual his money's worth." "I'm still wishing I were back in Colorado with my banjo... You obviously spent a lot of time organizing, planning and carrying out the week's events. This was a fun time for me, and also time well spent." "I appreciate the interest and care you showed me and each of the students. You have a way of making each student the most important person in the camp at the time. I'm trying to do everything that you told me to work on. 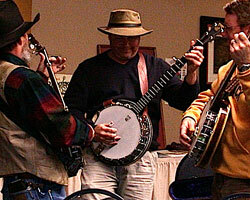 Last night one of the people in my band that the banjo sounded cleaner and louder than before." "I needed the camp and I feel the results are well worth it. I think the best part was the feeling that I left with a personal program to continue my banjo journey." "You did an excellent job of creating a calm and relaxed atmosphere in what is a potentially nerve-fraying situation. The camp provided all things necessary for my development as a banjo player and as a musician in general: com-posure, confidence, motivation, self-analysis, and comprehensive learning skills. I can't begin to thank you enough for having all of us." "Ever since your camp I have progressed rapidly. I have more than doubled my song vocabulary, I have written several of my own songs, and everyone I know has seen a world of difference in my playing." "I needed this camp to break out of the isolation in which I find myself learning the banjo. My confidence is at a high point thanks to you and the opportunity to jam and learn from other players. I had a wonderful time." "Wherever your level of picking falls, there is something for you at the camp. Pete has an uncanny ability to zero in on areas each picker needs to work on." "It's not every day that I get to sit down with a world renowned banjo player and have the kind of one on one session that every player dreams of. The things I picked up there will last a lifetime." "It has opened up a whole new world of banjo playing for me." "I want to tell you how much I enjoyed banjo camp. I learned a lot, matured as a player, was inspired, and made great friends. What more could you ask from a vacation?" "I came to camp burdened with banjo frustration. By the end of camp, my right hand and left hand capabilities had improved. More important, I went away confident of continued improvement, and with a renewed enthusiasm." "I wanted to thank you for a wonderful and inspiring clinic. You really have a remarkable gift as a teacher to evaluate where each person is and what would be the next step to improve. Thanks very much for opening my horizons, I feel reenergized regarding the banjo and feel that things are coming along well."